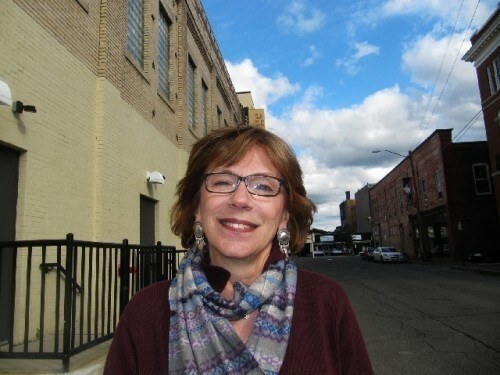 Julianne Boyd artistic director of Barrington Stage Company. Giuliano photos. During a media lunch to announce the season Julianne Boyd, the artistic director of Barrington Stage Company in Pittsfield, waxed poetic. Noting the iconic song "To Dream the Impossible Dream" from Man of La Mancha which launches the Boyd-Quinson Mainstage season she took that as an analogy of the company which started in a school in Sheffield in South County. She recalled how during the first production Diary of Anne Frank they counted 25 cars in the parking lot. Gradually that grew to 35 then 50. Now relocated to Pittsfield on some nights it's a bit of a scramble to find parking. The move several years ago involved faith and risk taking. Boyd was reminded of a conversation with a respected arts maven that leaving South County and its audience of theatre loving, summering New Yorkers would kill the company. Boyd conceded that she knew she would loose some of her audience but hoped to build a new one in the midpoint of the Berkshires. The gamble several years ago has paid off although she described a difficult transitional season during the build out of a new theatre. There was the anxiety of paying down a debt that is now retired. Currently the company is renovating its second theater in the former VFW a short walking distance from the Main Stage. The $400,000 project has been pre paid and incurs no debt. In 2013 we spoke with Boyd about retiring Barrington's debt. Little of the infrastructure will be visible to audiences. There is a new roof. Most of the renovation entails back stage build out for dressing rooms, bathrooms and a green room. The actors had to make do with makeshift facilities and even wait to use bathrooms after the audience was seated. With steady and growing audiences for generally enticing and well balanced seasons Barrington is no longer broke by the end of summer. There is a fall fund drive but the sale of season subscriptions which have increased provides winter-over revenue to pay for bills in March for upcoming productions. While many companies cast stars to sell shows for the most part Boyd avoids that approach. The star system results in the sale of single tickets depending on casting. Instead she wants the audience to trust in the uniform quality of programming leading to selling season subscriptions. "We recently celebrated the 100th performance of On the Town," she said. The vintage Leonard Bernstein musical started in Pittsfield before a transfer to Broadway. If the enticing musical seemed compressed at Barrington it has been scaled up with a bigger cast on one of Broadway's largest theaters. With most of the original cast members from the Barrington production the musical looks similar but much bigger on Broadway. To get a sense of scale the budget for sets in Pittsfield was about $10,000. While keeping the same look and concept for Broadway designers had some $900,000 to spend. In a huge house there are a lot of seats to sell. Now in the dead of winter, when Broadway slows to a crawl, I asked if On the Town will make it to Spring? Boyd responded that the plan is to keep it running through Tony season. If, as anticipated, it wins awards it's anyone's guess how long it might run after that. I asked about the challenge of meeting the weekly nut in such a large house. Boyd explained that it is based on the overall sale of tickets and not the percentage of seats sold. Even with less than a full house weekly sales are compared to those of other musicals. With strong reviews the audience for the show, largely through word of mouth, continued to build during the fall and holiday season. It continues while other new musicals, including a project with Sting, are closing this month. Traditionally sales pick up in March with the increase in tourism. Because of the daunting economics of musicals on Broadway the old system of out of town tryouts is a thing of the past. This has been replaced by taking promising shows from regional theatres. Under Diane Paulus American Repertory Theatre had winners with Pippin (now closing) and Porgy and Bess which had a successful run. Williamstown Theatre Festival sent the musicals Far from Heaven and Bridges of Madison County with so so results. It's drama Elephant Man is a current hit. Two more Fool for Love and Living on Love are Broadway bound. I asked if having these Berkshire shows on Broadway has changed the chemistry with producers? Is it easier to entice them to consider Barrington's works in progress? Boyd conceded that there have been dialogues but nothing that particularly entices her. She was emphatic in a mandate to provide good plays and quality programming rather than playing the star system. It's a different strategy than that of Broadway babies like Paulus at A.R.T. and Jenny Gersten formerly of Williamstown Theatre Festival. Yet again Barrington is front loading the season with a popular musical. It will star Jeff McCarthy who played Sweeney Todd in 2010. The Sondheim show proved to be too dark to attract a boffo audience. Murder and cannibalism are hardly proper fare for summer audiences. McCarthy, however, was stunning then and should triumph as the delusional crusader. Boyd explained that while the show entails choreography it is not a dance oriented show like On the Town. "We wanted to get back to a show that primarily focuses on the voice." The general formula for the Main Stage has entailed a musical, comedy and drama with a message play in the fall oriented to community and education. While there will be drama on the second stage the Main Stage dance card this season appears to be a musical, then two noirish comedies. Surprisingly, Barrington is presenting its first play by Neil Simon his classic Tony and Pulitzer winning Lost in Yonkers. It will be followed by John Guare's newspaper comedy His Gal Friday adapted from the film The Front Page. (The original version of the play was presented at Williamstown Theatre Festival in 2007.) The fall slot will explore contemporary Islam in America with Veils a new play by playwright Tom Coash. In view of terrorism and increasing intolerance in France and Germany Boyd commented on the importance of theater as a resource for social and political change. Because she happened to be in Pittsfield for production discussions we were introduced to Jenn Thompson who is again directing Lost in Yonkers. She is the Co-Artistic Director of the TACT in NYC. For the 2012 production she explained wanting to make changes with a greater emphasis on the children. She described a week of agonizing while composing a letter to Simon who lives in California. How dare one suggest changes to an iconic award winning play? Some time lapsed before permission was granted just as the play went into rehearsal. Then she was shocked when a request came for two tickets. Every effort was made to conceal from the cast that Simon was in the audience. Sitting in the back of the theater he was soon spotted causing a buzz. Thompson described nervously observing Simon watching his play. After the performance it was announced that not only had Simon been in the audience but that he wanted to meet the cast. She recalled excited shrieks back stage. "The meeting lasted for an hour and included taking pictures" she said. Will lightning strike twice this summer? What follows is Barrington's press release. Performance dates for the previously announced Boyd-Quinson Mainstage production season opener Man of La Mancha will be June 10 through July 11. The press opening is Sunday, June 14 at 5pm. Man of La Mancha features a book by Dale Wasserman, music by Mitch Leigh and lyrics by Joe Darion. One of the world's most popular musicals, Man of La Mancha, the 'Impossible Dream' musical, is based on Cervantes' 17th century masterpiece Don Quixote, and tells the adventures of a delusional Spanish knight who sallies forth to restore order in the world and reclaim his lady love. Jeff McCarthy stars as Don Quixote, and Ed Dixon, who played Judge Turpin in BSC’s Sweeney Todd, returns to play the Innkeeper. Lorin Latarro, who choreographed last summer’s Kiss Me, Kate, will choreograph the production. Artistic Director Julianne Boyd directs. Associate Artists Darren R. Cohen and Renee Lutz will be respectively the Musical Director/Conductor and Production Stage Manager. Celebrating the 50th Anniversary of its debut in 1965, Man of La Mancha premiered at Goodspeed Musicals and opened at the ANTA Washington Square Theatre, November 22, 1965, where it ran for 2,328 performances. Starring Richard Kiley and Joan Diener, Man of La Mancha went on to win five Tony Awards including Best Musical. The production has received four Broadway revivals with Richard Kiley in 1972 and 1977, Raul Julia in 1992, and Brian Stokes Mitchell in 2002. Man of La Mancha is sponsored by Cynthia and Randolph Nelson, with additional sponsorship by Bonnie and Terry Burman. Winner of the Tony Award for Best Play and the Pulitzer Prize, Lost in Yonkers is a heartfelt and hilarious coming-of-age story by America’s great comic playwright, Neil Simon. Performances of Lost in Yonkers are from July 16 through August 1, with a press opening on Sunday, July 19 at 5pm. Director Jenn Thompson makes her BSC debut. She is the Co-Artistic Director of the TACT in NYC, where she directed a Drama Desk nominated 2012 NY revival of Lost in Yonkers. Like many of Simon’s plays, Lost in Yonkers is drawn from his experiences growing up in New York City. Set during World War II, two young brothers, Arty and Jay, are sent to live with their formidable German Jewish immigrant Grandmother, the sweet but mentally challenged Aunt Bella, and Uncle Louie, a small-time hoodlum running away from gangsters. Simon’s canon of comedies include such classics as The Odd Couple, Barefoot in the Park, California Suite, and his award-winning trilogy Brighton Beach Memoirs, Biloxi Blues and Broadway Bound. The original production of Lost in Yonkers played 780 performances at Broadway's Richard Rodgers Theatre. Gene Saks directed Irene Worth, Mercedes Ruehl and Kevin Spacey (all of whom won Tony Awards for their performances). Simon wrote the later screenplay for the 1993 film directed by Martha Coolidge, starring Richard Dreyfus with Worth and Ruehl reprising their roles. Lost in Yonkers is sponsored Norma and Sol Kugler. Barrington Stage will present the screwball comedy His Girl Friday, directed by Artistic Director Julianne Boyd, from August 6-30, with a press opening on Wednesday, August 12 at 7pm. His Girl Friday is adapted by John Guare from The Front Page by Ben Hecht and Charles MacArthur and the Columbia Pictures film. Associate Artist Christopher Innvar stars as Walter Burns alongside fellow Associate Artist Mark H. Dold, who will star as Bruce Baldwin, Hildy Johnson’s fiancé. Complete casting will be announced at a later date. His Girl Friday is sponsored by Rhoda Herrick. Barrington Stage will present Veils, a new play by playwright Tom Coash, a New Haven, CT playwright and director, from October 1-18, with a press opening Sunday, October 4 at 3pm. When Intisar, an African American Muslim student, arrives in Cairo for a year abroad, she hopes to finally be understood. She’s quickly enlisted by her exuberant Egyptian roommate, Samar, to help create a blog debating the practice of wearing veils, but when the Arab Spring intervenes, revolution threatens to overtake their friendship. Director TBA. Tom Coash worked as the Director of New Play Development at Stageworks/Hudson for several years. Veils was recently named the Grand Prize Winner of the Clauder Competition at Portland Stage where it premiered in February 2014. His play Cry Havoc was recently produced at the 2013 South African National Arts Festival (Main Programme). Barrington Stage opens the 2015 St. Germain Stage season with the New England premiere of Richard Strand’s Butler, directed by Joe Discher in his BSC debut. Butler will be presented from May 14 – June 13 at the St. Germain Stage, with a press opening on Sunday, May 17 at 3pm. Based on actual events that changed the lives of over 10,000 slaves, Butler is the recipient of the Edgerton Foundation New American Plays Award. The comedy, set at the beginning of the Civil War, follows Benjamin Butler, a successful Massachusetts lawyer, who has just been promoted to Major General and given command of Fort Monroe in Virginia. The inexperienced but shrewd Butler soon finds himself in the middle of an explosive situation, exacerbated by an equally shrewd runaway slave. Strand is the author of The Bug and The Death of Zukasky, both of which premiered at Actors Theatre of Louisville's Humana Festival. Other works include Ten Percent of Molly Snyder, My Simple City (nominated for best new script by both the American Drama Critics Association), Clown, The Lincoln Park Zoo, and The Second-Story Man. Butler received its world premiere at New Jersey Repertory in June 2014 and was directed by Joe Discher. Barrington Stage will present Conor McPherson’s Shining City from June 18 – July 12 with a press opening Sunday, June 21 at 3pm. Directed by Associate Artist Christopher Innvar, the production stars Associate Artist Mark H. Dold. McPherson's plays include The Seafarer, St, Nicholas, Dublin Carol, and The Weir, among others. His most recent play, The Night Alive, received its American premiere at the Atlantic Theater Company's Linda Gross Theater in New York in 2013. 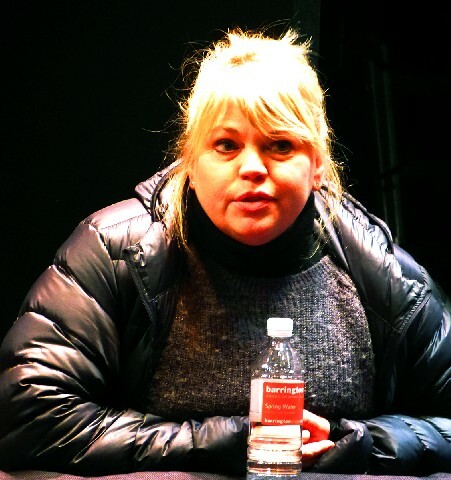 Shining City was originally presented by Manhattan Theatre Club at the Biltmore Theatre, May 2006, with Brian O’Byrne, Oliver Platt and Martha Plimpton. Shining City is sponsored by The Claudia and Steven Perles Family Foundation, with additional sponsorship by Sydelle and Lee Blatt. The third and fourth shows on the St. Germain Stage will be announced at a later date, as will complete casting for all shows. Barrington Stage Company’s Youth Theatre summer 2015 production will be the Tony-nominated musical Shrek The Musical TYA, to be presented July 22 – August 9 at Berkshire Museum (39 South Street) in Pittsfield, MA. Christine O’Grady returns to direct and choreograph. Based on the Oscar-winning DreamWorks Animation film, Shrek The Musical is a fairy tale adventure featuring songs from Jeanine Tesori (Thoroughly Modern Millie, Caroline or Change) and a sidesplittingly funny book by Pulitzer Prize-winner David Lindsay-Abaire (Rabbit Hole). Shrek brings all the beloved characters you know from the film to life on stage, and proves there's more to the story than meets the ears. In this TYA adaptation developed by The Coterie, a shortened running time make this the perfect show for families. Shrek The Musical TYA is sponsored in part by The Berkshire Eagle. All shows, casting and schedule subject to change. A full season of Mr. Finn’s Cabaret, staged readings, concerts and other exciting 2015 events will be announced soon. Save the most on the 2015 Season and enjoy priority access to the best seats when you buy a season pass. Season passes to the 2015 Season start at just $60 and offer savings of up to 27% off the 2015 single ticket price. Bonus Offer: Order now and BSC will waive your handling fees (a savings of $5 per pass) and guarantee you early access to priority seating beginning February 16, 2015. Single tickets will go on sale Wednesday, March 4, 2015 at 10am. Reservations for groups of 15 or more are now being taken and may be arranged by contacting Janie LaBrasca in Group Sales at 413-997-6118. For information on shows, passes and tickets call 413-236-8888 or visit www.barringtonstageco.org.